조선왕조 궁중음식은 고려왕조의 전통을 이어 온 조선시대 궁궐에서 차리던 음식으로 전통적인 한국음식을 대표한다. 궁중에서의 일상식은 아침과 저녁의 수라상(임금이 드시는 진지상)과 이른 아침의 초조반상(初朝飯床), 점심의 낮것상의 네 차례 식사로 나뉜다. 탕약을 드시지 않는 날에는 이른 아침(7시이전)에 죽과 마른찬을 차린 초조반상을 마련한다. 아침과 저녁의 수라상은 12가지 반찬이 올라가는 12첩 반상차림으로, 원반과 곁반, 전골상의 3상으로 구성되어 있다. 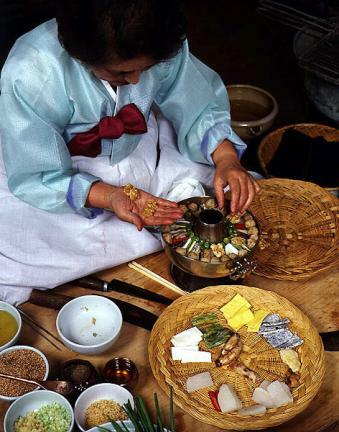 밥은 흰쌀밥과 팥밥 두가지와 육류, 채소류, 해물류의 다양한 재료로 여러 가지 조리법을 고르게 활용하여 반찬을 마련하고, 김치류와 장류 등을 차린다. 점심상이나 간단한 손님상은 국수 등의 면상으로 차린다. 왕과 왕비의 생신, 회갑, 세자책봉 등 왕족의 경사 때와 외국사신을 맞이할 때에는 연회식을 차린다. 조선왕조 궁중음식의 주식류은 수라, 죽, 응이, 면, 만두류가 있다. 반찬류에는 탕, 조치, 찜, 선, 전골, 볶음, 구이, 적, 전유화, 편육, 숙채, 생채류, 겨자채, 구절판, 전복초, 홍합초, 장라조리개, 육포, 족편, 육회, 어회, 숙회, 쌈, 어채, 김치류, 장류가 있다. 병과류에는 각색편, 각색단자, 두텁떡, 화전, 인절미, 약식, 주악, 각색정과, 다식, 과편, 약과, 강정, 숙실과(밤, 대추, 율란, 조란, 강란)이 있다. 화채류에는 청면, 화면, 오미자화채, 식혜, 수정과, 배숙, 수단이 있다. 궁중의 식생활은 『경국대전』,『조선왕조실록』, 각종 『진연의궤』,『진작의궤』,『궁중음식발기』등에 기록해 놓은 그릇, 조리기구, 상차림 구성법, 음식이름과 음식의 재료 등을 통해 상세하게 알 수 있다. 조선왕조 궁중음식은 조선왕조의 몰락과 함께 잊혀져가게 되었고, 근대 이후 급격한 정치, 사회적 변화를 겪으면서 우리 고유의 식문화도 크게 바뀌었으므로 조선시대 궁중에서 차려지던 음식을 국가무형문화재로 지정하여 우리 식문화의 전통을 잇고 있다. 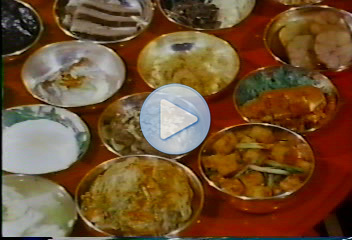 Four daily meals were served to the King. 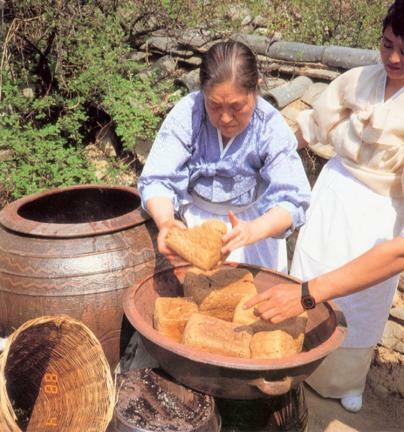 Before 7:00 AM, chojobansang (a breakfast composed of porridge and dried side dishes) was served when the King did not have to have a medical decoction. 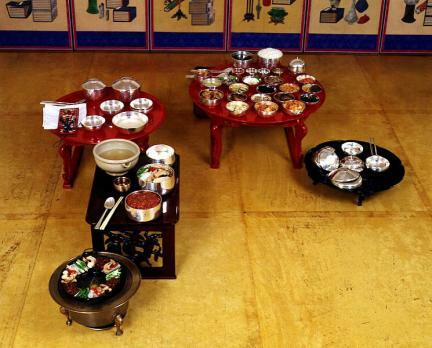 Breakfast and dinner were served on three tables, wonban (the main table containing white rice, seaweed soup, stew, a steamed dish, kimchi and 12 side dishes: gyeotban (a side table containing rice with red bean, casserole, empty bowls, and a tea cup) and jeongolsang (a side table containing jeongol [casserole], meat, sesame oil, egg, and vegetables). Lunch or a meal with a visiting guest was served with noodles. 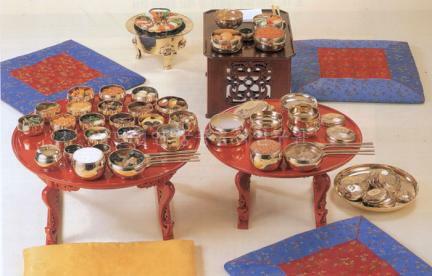 Banquet meals were served on congratulatory occasions like the birthday of the King or Queen or the designation of the Crown Prince, or for greeting a foreign royal envoy. 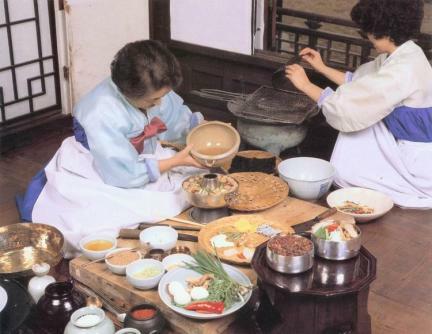 During the Joseon Period, the main meals served at the Royal Palace were porridge, starch porridge, noodles and dumplings, in addition to cooked rice. 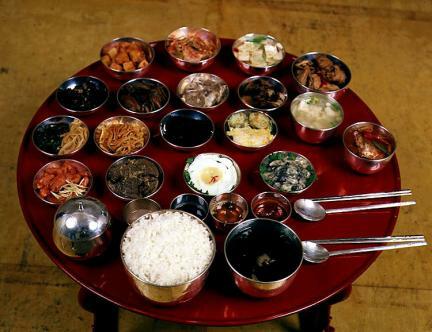 Side dishes served were broth, a steamed dish, steamed vegetables, casserole, stir-fries, a grilled dish, meat skewers, pan-fries, boiled meat slices, boiled and fresh vegetables, mustard-seasoned vegetable, gujeolpan (a platter of nine delicacies), braised abalones, braised mussels, jangnajorigae, beef jerky, jokpyeon (ox foot jelly), beef tartare, sliced raw fish, parboiled sliced fish, leaf wraps, parboiled fish with vegetables, kimchi, and soy sauce. 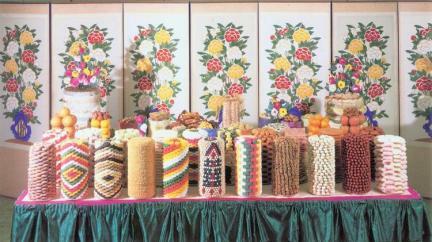 An assortment of rice cakes, honeyed juice mixed with fruits as a punch and processed fruits were also served, chestnuts, jujubes, yullan (chestnut balls), joran (jujube balls), and gangnan (ginger balls). 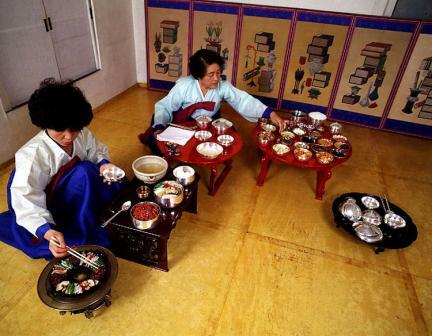 Literature concerning the Royal Palace cuisine of the Joseon Dynasty includes Gyeongguk daejeon (National Code), Joseon wangjo sillok (Annals of the Joseon Dynasty), Jinyeon uigwe (Royal Protocol of the Royal Banquets), Jinjak uigwe (Royal Protocol of the Conduct of Banquets), and Gungjung eumsik balgi (List of the Royal Cuisine). 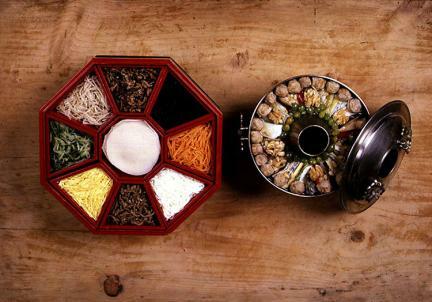 The Joseon Dynasty came to an end in 1910, and Korean cuisine culture has changed drastically with the passage of time. 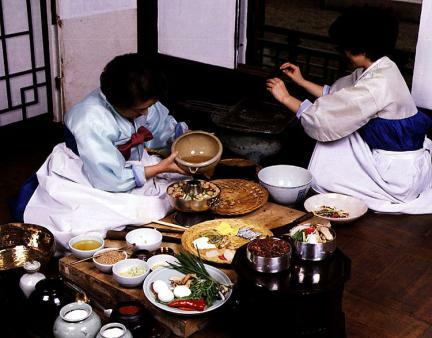 Royal Palace cuisine has been designated as important intangible cultural heritage in an effort to preserve the country’s cuisine culture tradition.